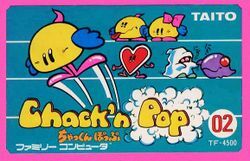 Chack'n Pop is considered by many to be the precursor to the venerable game Bubble Bobble. The cast consists of two enemies that would later be seen in Bubble Bobble. Unfortunately, fans of the Bubble Bobble series may find Chack'n Pop less fun to play due to its high degree of difficulty. The game puts the player in the role of Mr. Chack'n, who must rescue all of the hearts that were stolen during a romantic interlude between him and Miss Chack'n. Chack is an interesting character with interesting abilities. He can toss two bombs, only one in each direction at a time. He can also effortlessly go from walking on the floor to walking on the ceiling. If the ceiling is low enough, Chack can extend his legs until his head touches the ceiling to immediately begin walking on it. Chack must use his bombs to release the captured hearts from their cages. Once all of the hearts are freed, he can escape through the top right corner of the maze. Along the way, purple Monstas will be trying to stop Chack simply by colliding with him. Chack can use his bombs to defeat the Monstas, but the limited use he has over them makes the bombs an unreliable attack method. Once Chack spends enough time in a maze, it is not uncommon for Chack to become completely overwhelmed by the presence of the Monstas. Taito ported the game to several popular Japanese systems available at the time, including the Sega SG-1000, NEC PC-6001, the MSX home computer, and a version for the Famicom that contained only 9 of the 14 original levels. It was also included in Taito Legends 2 for the PlayStation 2, Xbox and Windows. Jealous of the love between Mr. Chack'n and Miss Chack'n, the Mighta wizards construct a plan to steal their love and break them apart. They use Monstas to capture their hearts, and Mr. Chack'n must chase after them to retrieve the hearts in order to reunite him with his love and restore their relationship. The Monstas will attempt to stop Chack as he makes his way through 14 mazes in an effort to free the hearts from the cages with his bombs. Chack starts every level in the upper left corner of the screen, and must free every heart from their cage in order to exit the stage through the upper right corner of the screen. Chack can throw a bomb to the right and to the left, and can only throw one bomb per direction at a time, but he can throw both bombs in both directions simultaneously. Bombs are needed to free the hearts from the cages. Chack can walk on ceilings, and can extend his legs to reach ceilings that are low enough. Chack can drop from a ceiling at any time. Chack must avoid contact with the purple Monstas. He may bomb them to destroy them, but he must also avoid the smoke created by the bombs. Bomb smoke will also destroy Monsta eggs. If Chack manages to destroy more than one Monsta at a time, he will earn a special bonus fruit that he can collect for points. He may occasionally earn a super heart power up that makes him invincible for 10 seconds. This page was last edited on 27 June 2012, at 04:59. This page has been accessed 13,701 times.